Good morning! 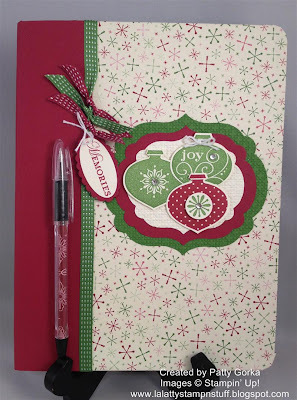 Today's 52 Christmas Card Throwdown challenge is anything, but a card, tag, or ATC. I love making these altered notebooks so for today's challenge I knew exactly what I wanted to do. I posted a tutorial awhile ago about how I make these so if you would like to see my tutorial you will find it here. In that tutorial you will see how I cover my notebook with designer series paper and how I fill the pen with matching paper. To complete my notebook I used the Label Framelits for the layers behind the ornaments. The gumball green and very vanilla layers were dry embossed using my square lattice embossing folder. The ornaments were stamped and punched out using my ornament punch. I did use a 3/4" circle punch for the image in the center of the raspberry ripple ornament. I used dimensionals to raise up the ornaments. Each ornament has a rhinestone jewel on it and I tied some twine around the top of the one gumball green ornament. I decided to stamp the 'memories' sentiment and it is layered using oval punches. I tied the sentiment onto my ribbon using twine and it's finished off with a bow. Thank you so much for stopping by! Be sure to visit the other 52 Christmas Card throwdown design team member's blogs and see what they've created! Very cute! I have a whole bunch of notebooks ready to alter and have not touched them. You have inspired me! Patty, this is wonderful - very practical and useful but pretty as well! Love the matching pen - it's all in the details! There are those cute notebooks again! Love them. You make them so well. Oh this is gorgeous Patty! Thanks for sharing the whole paper in the pen idea - fab for workshops! Love this notebook and the matching pen is a real wow factor! The colour combo is fab, and you know that I adore Christmas ornaments lol! Brilliant project. Love this! Love your designer paper... will have to get with you about some of that stuff! I LOVE IT! Thanks for the link back to the how to of the cute notebook and PEN! Patty, this is a wonderful project! Very pretty!!! This is so awesome Patty! I have several composition books that I had picked up a while ago with the intent to do something like this but never go around to it. I think I might just have to dig them out and CASE you immediately! Hugs!